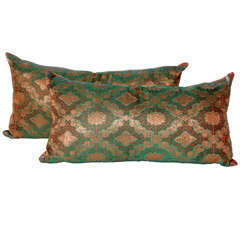 An embroidered silk pillow in gold, green and persimmon. Backed with 100% wool fabric. Gorgeous dark olive silk velvet pillow with vintage French ribbon accent. Hand loomed and brocaded silk. Chinese Hill Tribe production. Skirt trim ribbons sewn together. Black linen back, invisible zipper closure, feather and down fill. 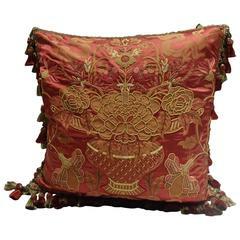 Beautiful pillow made of hand embroidery silk, on cream color background, exceptional flowers and vine motifs all around, silk backing, frash new insert. Beautiful pillow made of hand embroidery silk on cream color cotton background. Flowers and vine motifs all around, cotton backing with zipper, fresh new insert.